Quadrathon Festival is just 5 weeks away so we’re busy getting our “ducks in a row” to have everything right for you when you arrive. We have a few exciting announcement over the next few weeks and as soon as things are finalised we will let you know. Right now there is 1 deviation from the website. 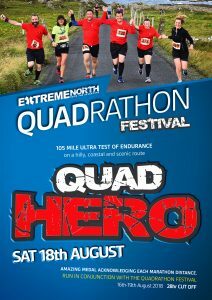 The 105 mile / 28hr HERO race entries will close in 1 week on the 17th July, so if your planning to give that a shot please get entered immediately.